Our spine is made up of a stack of individual bones (known as the vertebrae) and in between these bones, there is a jelly like cushion (nucleus pulposus or disc) that supports the human body’s range of motion and the overall movement of the spine. 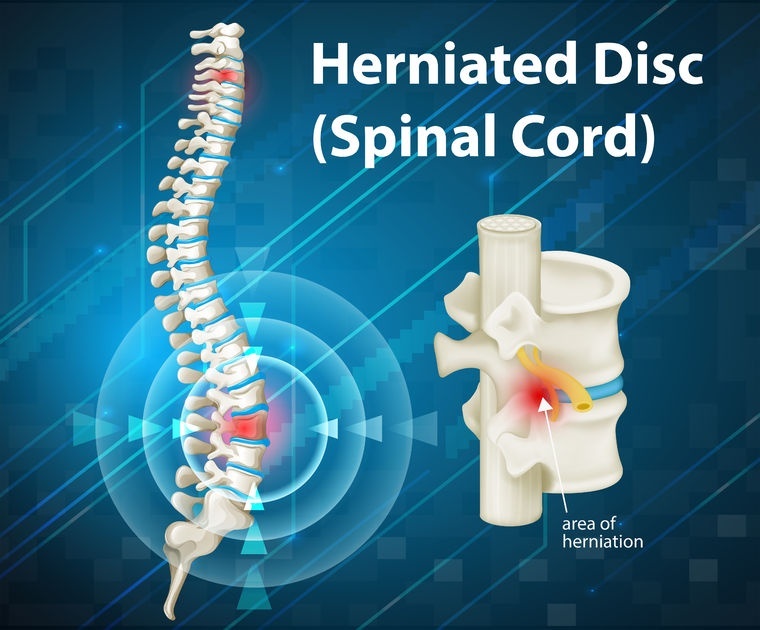 In simple terms, a herniated disc occurs when the cushioning jelly oozes out of its original placement (outside of the vertebrae) and touches a nerve, causing pains, tingling feelings, numbness or general weakness in the arms, back and legs. You must have heard of the terms ‘Pinched Nerve’, ‘Slipped Disc’ or even ‘Bulging Disc’ in addition to herniated disc; all of which are linked to some form of spinal pain or overall discomfort. 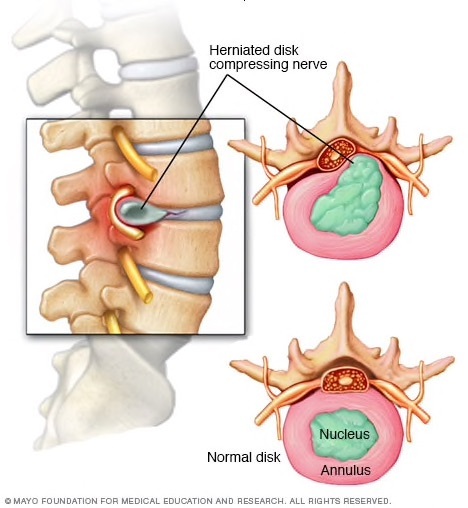 The pain depends on how much the disc pushes on a nearby nerve (and inflaming it) which is why some people either have excruciating pain or even no pain at all. There are times when you might not even know that you have a herniated disc until you do an MRI scan as the symptoms do not show. The pain can also turn chronic over a period of time if not taken important measures to address the condition and the pain can also make daily activities quite stressful. The reason being, the pain radiates through the nerves that connects to the lower part of the body which is why some people have pain in their calves, hips and/or thighs. In addition to the pain, the natural spine curvature gets distorted and leads to other problems such as scoliosis and flexed/externally rotated knee or hip joints due to extensive nerve compression. Majority of herniated disc conditions happen in the lumbar spine (the lower back); and some happen in the cervical spine (the neck). – Disc Degeneration. As we age, the disc loses some of its contents which effects the range of motion and a small twist or strain can cause inflexibility and/or tear. – Extensive use of the back muscles instead of other muscles to lift heavy items; the body movements while doing such activities can cause stress on the discs. – Genetics. 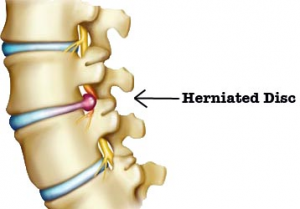 Sometimes we inherit the genes of our families who may have also suffered from herniated discs in the past. – Poor Posture. A bad posture puts pressure on the spine and discs, especially when sitting incorrectly at one position for so long. – Overweight. A heavy body puts greater pressure on the spine and discs. So now coming back to the question of the title…… Can Pilates Solve a Herniated Disc Problem? The Answer: Anecdotal evidence suggests, a patient requires approximately 4 months (3 days a week) of a customized and focused therapeutic Pilates program to determine whether it can completely solve the condition or not. However, Pilates is the perfect balance between healthy mobility of the body as well as rehabilitation therefore, is definitely one of the best solutions to addressing disc herniation as the body will recover from its initial state. 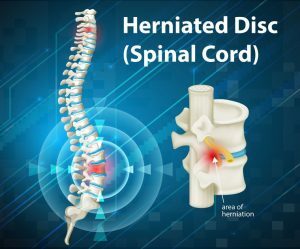 Majority of people who have herniated discs do not require surgery however; doctors or surgeons may think differently and may convince you to do one. According to research, non-surgical approaches, such as Pilates done over a long period of time are just as effective as the surgical approach for addressing disc herniation. Pilates reduces any wear or tear of the muscles because the exercises reduces the tension on the intervertebral discs and joints as well as the compression of the nerves. Addressing disc herniation (within individual limits) through Pilates will reap benefits as there is a recovery! The key is to continue the routine regularly. Moreover, guidance from a Professional and Qualified Teacher who brings the patients to the Precision of movements, uses proper Skills and takes Care of the patient’s recovery is so important.